Flipkart and Amazon, the two biggest e-commerce retailers in India, are now all set to battle out over luggage. The past year has seen the rivalry between the two e-commerce giants intensify further. According to the present data, Amazon’s website and app are more popular than Flipkart’s offerings. But the deal between Flipkart and Walmart, another US retailer, is expected to turn the game in favour of Flipkart. In comparison with Flipkart, Amazon is leading in the market share, still, Flipkart is betting big on luggage. Luggage is an important category for both the retailers as the demand for travel merchandise is ever increasing. The vice-president for home, fashion and furniture at Flipkart, Rishi Vasudev, is certain of outpacing its competitor, Amazon, by the end of this year, because of Flipkart’s exclusive range of amazing offerings and private labels. Vasudev said that, currently, the gap between the market share of Flipkart and Amazon is marginal but they expect the market share to get inclined in their favour to 60-40 by the end of 2018. 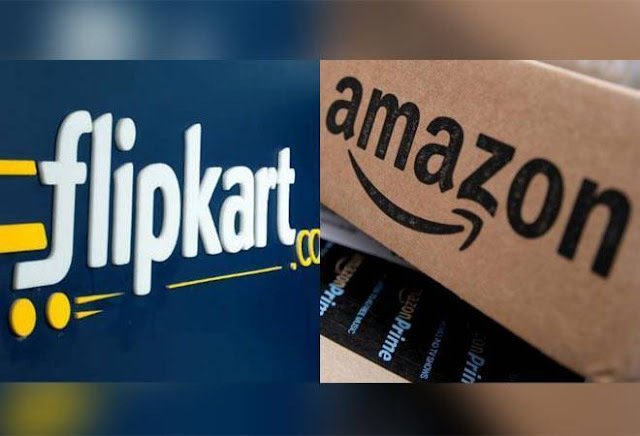 In the past few months, both Flipkart and Amazon were selling an almost same number of products, but, on value terms, the US e-commerce giant, Amazon continues to lag behind Flipkart. As per The Economic Times report, last month, Amazon made average daily shipments of around 4.5 lakh products whereas Flipkart's average daily shipments stood at 5 lakh items. However, the battle to grab the top position is still on between Flipkart and Amazon. With a selection of more than 500 brands, Amazon India introduced the luggage category on Amazon Fashion back in 2014 and affirms to have experienced a growth of over 100%. Arun Sirdeshmukh, business head at Amazon Fashion, said that the demand for travel merchandise is increasing continuously across the country, with respect to the same, luggage is an important category for them. Grocery is another such category, which will drive this rivalry deeper as Flipkart and Amazon are both planning to enter this arena and is likely to drive volume growth. Every year, during the festive offers, both Amazon and Flipkart get engaged in a stiff battle. Last year, during Amazon's festive offer, the firm claimed to have shipped over 15 million products, almost three times bigger than last year's sales. Flipkart also gave tough competition to its rival and recorded its highest-ever single day sales during its Big Billion Days sales offer and sold units worth INR 1,400 crore. With Flipkart merging with Walmart and stepping into the arena of luggage, it will definitely result in a reduction of traffic on Amazon.in. Flipkart will be introducing private labels and exclusive products under its newly inaugurated category “luggage”. Flipkart has planned to take over the market share by the end of this year, by its introduction of luggage, grocery and many other categories. Walmart and Amazon have been global rivals, since the establishment of Amazon, and now, with the Walmart’s acquisition of 77% stake in Flipkart for $16 billion, the competition between the two e-commerce giants will be worth watching. On the other hand, this competition between Amazon and Flipkart is beneficial for Indian e-commerce market as well as for customers and sellers. The prices will be lower, quality will be better and delivery will be faster, because of the ongoing battle between the two, to be at the top. Jeff Bezos, founder and CEO of Amazon, said in his annual letter to his shareholders, that he sees great potential in Indian e-commerce market and the company will not stop investing in India to make their services the best. Walmart, the 77% stakeholder of Flipkart, is also all set to invest in Indian e-commerce market and introduce a variety of new products as much lower rates. So the battle between the two internet behemoths has definitely excluded other e-commerce retailers, like Snapdeal, Jabong, etc. out of the race. Battling over luggage will give the Indian e-commerce market a boost and customers, a great variety of luggage at cheaper rates.